The twilight ladybug is your best friend at bedtime! Just press the button and this soft plushy ladybug will project colourful star constellations all over walls and ceilings. 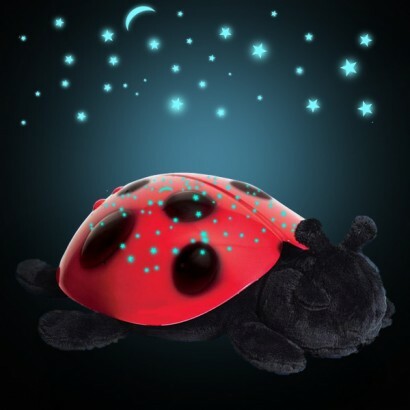 Powered by three AAA batteries, Twilight lady-bug can go wherever you want to keep you company and, with a push of a button, will light up in your choice of red, green or blue coloured light and project star constellations around walls and ceilings as well as keeping you comforted with a glowing night-light shell. Twilight lady-bird projects random stars with seven real constellations including Leo the lion and Pisces the fish which you can spot with the help of the included star guide. I was very impressed with this product it does everything that it says it does.my granddaughter loves it. This is a lovely night light & lasts for a lot longer than a lot of projectors. The stars are a little big (I would have preferred slightly smaller more defined stars) but good for the baby to look at. Very calming but the constellations don't seem to change like I thought they would? Otherwise love the product.